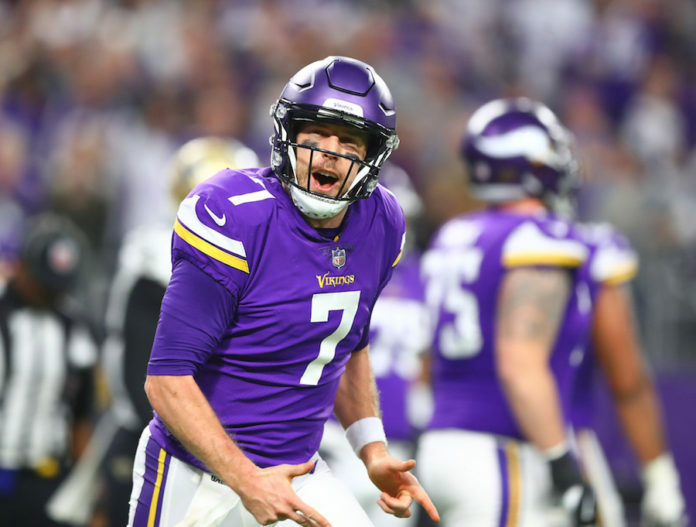 In his NFL career, Case Keenum has had many ups and downs, enjoyed big wins and suffered through bad losses, all while fighting off another quarterback for the starting spot on the team or as an injury replacement. Now the newly-signed free agent is finally ‘the man’ in town as the starting quarterback for the Denver Broncos — and the spotlight is his. “I think there’s a precedent set with certain things. It feels good, it does. For me, I’m going to accept it. I know there’s a responsibility with that too. It’s not something where I feel like, ‘I’ve made it.’ That’s not ever my mentality. I’m going to stay hungry,” Keenum said during his press conference on Tuesday. He won’t have anyone breathing down his neck for the starting spot, but that isn’t keeping Keenum from focusing on consistency and always earning his keep. Keenum comes to Denver after leading the Minnesota Vikings to the NFC Championship game and says that his leadership approach is much more than just talking football. “I would say I don’t really start with football. Maybe a little bit conceptually; high-level, mindset-wise. I just want to get to know the guys. Are you married? Do you have kids? What do you do? How are you off the field? Try to build the relationship there and start there,” Keenum said. Click here to listen to the full press conference with Case Keenum, including what he had to say about his new teammates, coaching staff and more, or watch the full press conference below.